Blackfeather were one of the most popular and successful groups of the early '70s, and produced one of the landmark Aussie progressive rock albums, but a major split early in the group's history disabled what should have been a promising career for founder John Robinson. With Blackfeather going through at least six major incarnations between 1970 and 1983, with a huge personnel list for each version. The list is a veritable 'Who's Who' of the 70s rock scene. However it's the first two lineups - 'Mark I', who made At The Mountains Of Madness and 'Mark II' who recorded "Boppin' The Blues" - that are the best known. At The Mountains Of Madness was released in April 1971and was a national Top 10 LP (#7) in May. The album has perhaps not aged as well as some others from the period; the title track and the ambitious suite "The Rat" sound a little dated now, although there is sterling playing by Robinson throughout. Still, there are plenty of highlights, including the heavy-riffing "Long Legged Lovely" (with some of the heaviest bass yet captured on an Aussie recording) and the classic "Seasons Of Change", one of the most memorable and adventurous singles of the period. (Both songs were included on Raven's Golden Miles CD compilation in 1994). Claiming that in Australia before AC / DC did not know what rock n roll is definitely wrong. This distant land hides many fantastic teams in the most forgotten today. One of these pearls is a wonderful debut Blackfeather. Its additional advantage is that in recording this album attended by 25-year-old Bon Scott. From today's perspective it can be a marketing gimmick, but it would be a pity if "At The Mountains of Madness" is inscribed in the history of rock just as exalbum leader AC / DC. In 1971, four young Australians has recorded an album that permanently engraved in the annals of music, becoming an inspiration for future generations, yet tasty morsel, sought after by fans of the old rock. In his music, have entered into everything we love most about him. There is no shortage of acute here, playing rock blues spiced sauce a la Led Zeppelin, psychedelic sound straight from the early Pink Floyd, and folk inclusions reminiscent of albums Curved Air. All of these items are in perfect proportions and played with mastery in no way betraying the young age of the musicians. 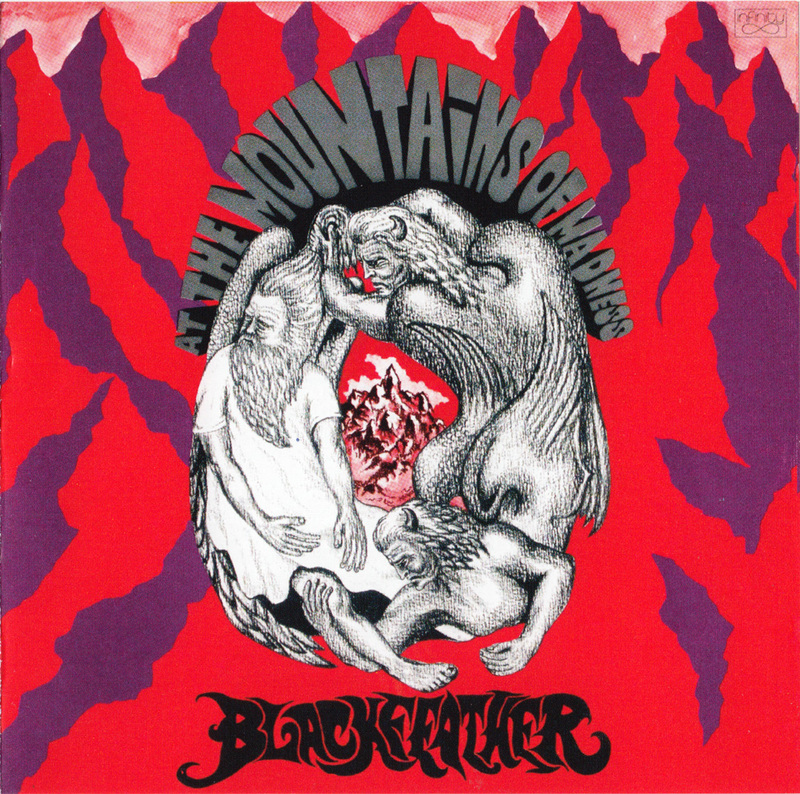 Blackfeather music can be described as heavy-rock with a characteristic of those times psychedelic color. The album is a complete range of aranży and departures. By sharp guitar riffs, ballads, Oriental (inspired by the dollar anyway Leone trilogy) "Mangos Theme Part 2", folk were "Seasons Of Change", to complete puzzles and abundant in the funny story suite "The Rat". Must commend the entire section of music, with honors Neale Johns - 18-year-old, who has recorded an extremely powerful, poignant and diverse vocals (like Dr. Jeckyll and Mr.. Hyde! ), And guitarist John Robinson, which was considered to be leading next guitar heroes Lobby Loyd and Kevin Borichema. Unfortunately, after the release of its debut ranks Blackfeather been firmly thwarted. The composition has changed repeatedly (scrolled by a team of about 50 names! ), And further their releases a lot of dissent from the sensational level "ones." "At the Mountains of Madness" is the album idealnnie finding in our time - almost 41 years after its launch. Somewhere in the background was heard gentle guitar, form the background for the story told by Neal Johns. He speaks of his journey. But he does not say where it is going and what is the purpose of this trip. At the edge of the forest he meets a mysterious old man. Accepts an apple from him, after eating which goes to sleep, which is the gateway to the title "Mountains of Madness". At this point the work atmosphere changed completely. Blissful peace disappears without a trace, replaced by horror idyll. Melody suddenly stops. There are disturbing chords guitar, Mike McCormack strikes vertiginous rhythm of the drums, and so far cheerful voice of the narrator, turns into an electronically distorted voice, which, combined with eerie backing vocals, skandującymi indefinitely word "madness", introduces the listener to the land, where the narcotic mixed with visions of nightmares and reality loses its outline ... So begins the album. And then? Then it is even better! The album has six tracks - the first was mentioned at the beginning. This is followed by a much calmer, "On This Day That I Die", although there is no lack sophisticated drama, especially in the final part, where the foreground is an emotional vocal and guitar solo Johns John Robinson. The next track to be counted as the most beautiful parts of this album. I am thinking of "Seasons of Change Part1" extraordinary beauty of folk melody and zapadającymi long in the memory parties acoustic guitar and flute, on which he guest starred ... Bon Scott! They are by no means the only advantages of this song, but rather songs, and Johns because he gave his all, singing with such feeling, as if it was the last thing you have to do in life. Its a little "mucky" even the original voice exudes strength and seething passions, which fits well with frenzied string section, appearing in the chorus. Sensational, than even a classic example of a ballad than a rock anthem, where pathos mixed with melancholy - a class of its own! Next in order of "Mangos Theme Part 2" gives the impression that the members of the group Blackfeather was also no stranger to classical inspirations. This extended instrumental compositions with recurring motif and the increasing pace - like "Bolero" - reveals the full beauty of their artistry. Particularly noteworthy is the guitar and violin duel against incredible rhythm narzucanego them by percussion. One would like to see a live performance of the song, because it's hard to believe that you can play in such a dizzying pace! Brilliant, energy dripping sounds, reminding us of a time when the guitar was the instrument through which the soul of a musician can get away from each other and the audience! Other side of the vinyl release opens composition "Long Legged Lovely". Certainly it usatysfakcjonowałaby hard rock fans playing the blues with roots dating back because this is the beginning and the end. In the middle of the song is, however, a change of mood, signaled by the development of vocal Johns. The album closes with an intriguing trzynastominutowa suite entitled "The Rat". In the musicians Bleackfeather completely gave vent to his creative passion, creating a complex, multi-part form, where blues intermingled with hard rock and psychedelia, and even experiment with the possibilities of recording equipment and no formal framework does not limit their search. The end of the 60's, and the next decade were full of this kind of music. Many of them have gained a well-deserved fame and still inspires the newly emerging teams, but even more forgotten. I hope that a similar fate will never meet a brilliant album "At The Mountains Of Madness" Australian band Blackfeather - with its exciting finale at the forefront! Forget the complaints from your neighbors, children's crying, the siren of the police and the ambulance which picks you up. PLAY IT LOUD!!! Bon Scott plays the recorders on "Seasons of Change".